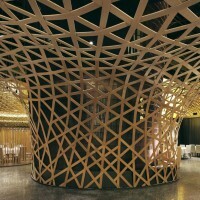 Beijing-based Atelier FCJZ designed the Tang Palace restaurant in Hangzhou, China. 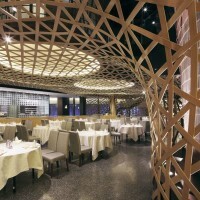 The restaurant is located on the top floor of a superstore in the new town area of Hangzhou, with 9-meter high story height and a broad view to the south. 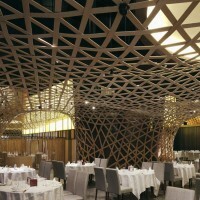 Composite bamboo boards are selected as the main material, conveying the design theme of combining tradition and modernity. In the hall, to take advantage of the story height, some of the private rooms are suspended from the roof and creating an interactive atmosphere between the upper and lower levels, thus enriching the visual enjoyments. 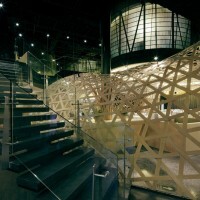 The original building condition has a core column and several semi-oval blocks which essentially disorganized the space. 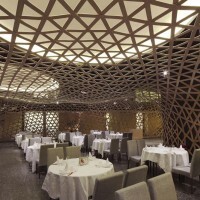 Hence, our design wants to reshape the space with a large hollowed-out ceiling which is made from interweaved thin bamboo boards; and extending from the wall to the ceiling. 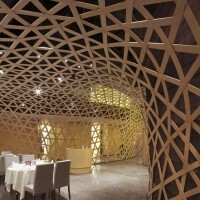 The waved ceiling creates a dramatic visual expression within the hall. 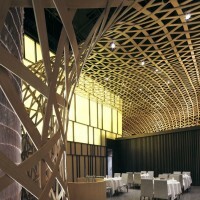 The hollowed-out bamboo net maintains the original story height and thereby creates an interactive relation between the levels. We also wrapped the core column with light-transmitting bamboo boards to form a light-box, which transforms the previously heavy concrete block into a light and lively focus object. 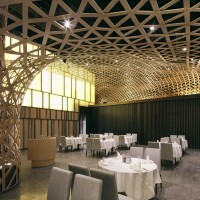 The entrance hall also follows the theme of bamboo. 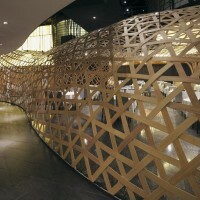 The wall is covered with bamboo material which follows the original outline of the wall, turning it into a wavy surface. 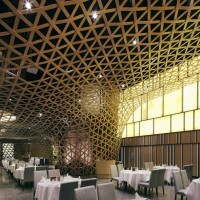 In this way, the surface echoes the hall ceiling as well as performs a guiding function for customers. 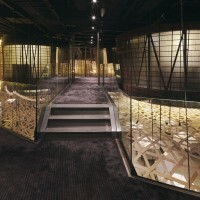 The design of private rooms embraces different characteristics. 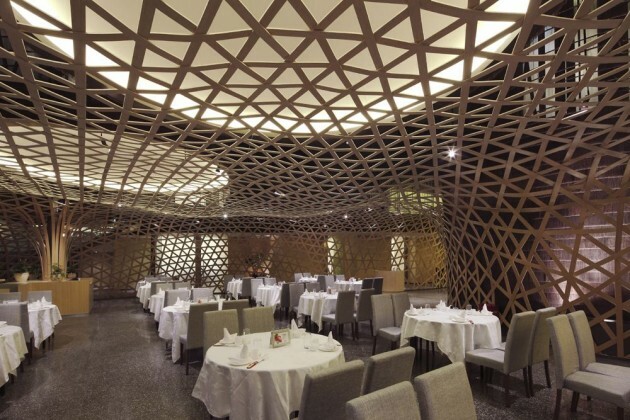 The rooms on the first level are relatively bigger and share the features of expanded bamboo net from the wall to ceiling and ornamentally engraved wall surfaces. 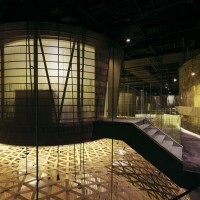 Meanwhile, the different folding angles and engraved patterns make each room different from one another. 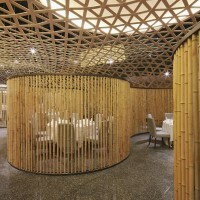 The rooms above on the south are smaller and feature a special waved ceiling pattern and simple bamboo wall surface, which creates interesting and spacious room features. 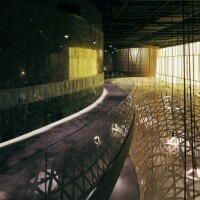 The key design concept of the space is that the suspended rooms are connected with suspended bridges and sideway aisles. The semi-transparent wall provides a subtle relationship between the inner and outer spaces, bestowing people with a special spatial experience. In this design, we hope to create diversified and yet an interrelated interior spaces through the different usages of the new bamboo material, responding to the local culture while seeking intriguing spatial effects. Client: HongKong Tang Palace Food&Beverage Group Co., LTD.